Open Heaven [9 February 2019] Conformed to His Image? - Open Heavens Daily Devotional Messages, By Pastor E.A Adeboye. Open Heaven [9 February 2019] Conformed to His Image? Open Heaven 9 February 2019 Conformed to His Image? This has been God’s desire from the beginning (Genesis 1:26-27). Soon after creation, the serpent lured Adam and Eve into sin and they fell, thereby rejecting godliness and embracing worldliness with its devilish undertones. To redeem us to Himself, God sent His Beloved Son to be the Saviour of the world (1st John 4:14). Through His sacrifice, God’s salvation is freely made available to all. Those who genuinely receive His salvation become partakers of His divine nature and are expected to follow in His footsteps through their lifestyle (2nd Peter 1:4, 1st Peter 2:21). In essence, God is calling all of mankind to repent from their evil ways and to put on the new man, who is created after God in holiness and righteousness (Ephesians 4:24). It is clear from these verses that God knows that worshippers take after the God or gods they worship. He therefore ordained that His own worshippers should be conformed to the image of His Son, so that they may worship Him in spirit and in truth (John 4:24). The essence of Christian fellowship therefore is to be transformed to the image of the Almighty God through Jesus Christ His Son, who is set before humanity as the model of the redeemed life. Understanding the nature of God and obeying His commandments are key to living this transformed life. As we behold the glory of God in the place of worship and personal fellowship, we are transformed to the likeness of Jesus Christ in faith, obedience and total submission to God’s will. To be Christ-like is not a mere human effort to imitate Jesus; rather, it is the work of the Holy Spirit in a believer submitted to His Lordship, making him or her more like Jesus in faith, sanctification, holiness, evangelism and the work of ministry. 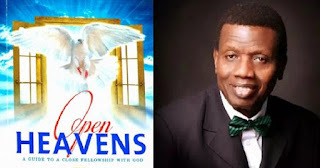 Labels: Open Heaven 9 February 2019: [Saturday] Daily Devotional By Pastor E.A Adeboye – Conformed to His Image?